But, because I'm an equal opportunity Detroit guy, here's one of a Detroit cop dancing at a carry out. #RocktheVote We here are MBN try not to get political, but when this happens, it's easy to be dragged in. This full-page ad appeared in The Lantern, the OSU student newspaper. Safe to say the few OSU students who do vote won't be doing so for this guy. As Yost says, "...if you're basing your choice for President of the United States of America on a football rivalry, maybe you shouldn't be voting." Agreed. But it's not like you can really trust the word of a politician anyway? The "Non-Denard running game" Brady Hoke backs up Fitz in his Monday presser. "Yeah, we would have liked to run the ball a little better," the Michigan coach said Monday. "But when you go back and look at it, you see ... Fitz ran for 170 yards against Purdue (last year). They weren't going to let him do that. "They were very concerned with taking that part of our offense away, even if Denard (Robinson) rushes for 235. So something's gotta give, and what gave was Denard 235." If you go back and look at the tape, and I know you all will – you will see that the Purdue D did key on Fitz quite a bit, which left things open for Denard to do his shred thing. When Rawls came into the game at the end and tore it up, that might have something to do with it. More like USATodon't. No B1G teams in the Coaches Poll for the first time in evaarr. Also falling out were Northwestern and Nebraska, leaving the Big Ten without a ranked team in the history of the coaches poll. Ohio State is undefeated but ineligible to receive votes in the coaches poll due to NCAA sanctions. The same applies to Penn State, which handed Northwestern its first loss Saturday. Lest we forget, it was the coaches poll that gave Nebraska a share of the national title in 97, so they can go right to...you know where. Never Forget. Ohio State Removing the "college" from "college football" one sweet recruiting class at a time. 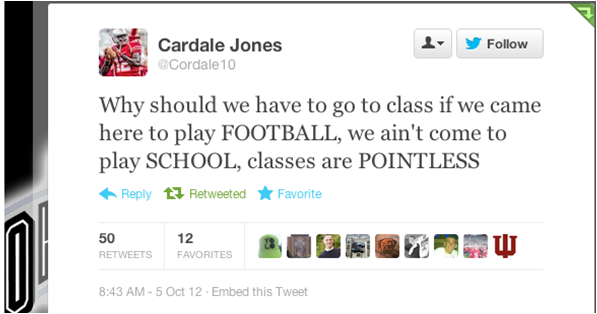 This was tweeted by 3rd string OSU QB Cardale Jones – who messed up the spelling of his Twitter name – which was promptly deleted and his account suspended. 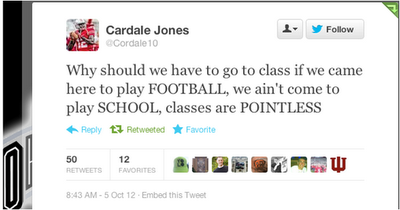 Hey, at least he says what we all already know to be true about OSU student athletes. We also didn't come to watch Gee make it rain with bowties, but life's just unfair all around. GIFFFF And now, your moment of zen. BWS gets all excited about Quinton Washington. VIDEOS! : Brady Hoke Monday presser. Shutdown Fullback goes all nutty over week 6. 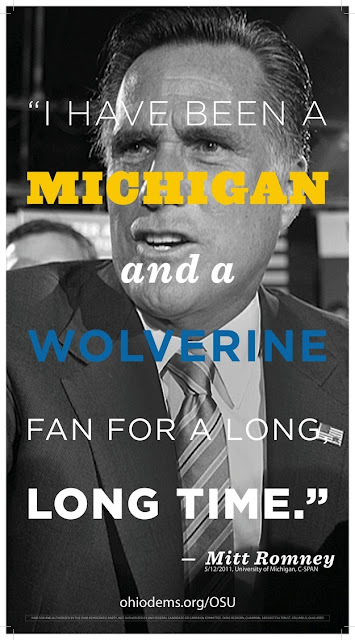 Inside Michigan Football Week 7.